As a bariatric patient with limited mobility, it can be difficult to find a rollator, wheelchair/walker combination aid, that can facilitate the extra weight. 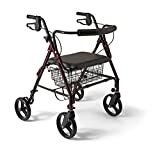 Luckily, there are plenty of them out there on the market made with a large weight capacity, that look and feel like a normal rollator with a balance between lightweight features and sturdy build. Let’s take a look at some of the features you’ll need to have in your bariatric rollator, and some suggestions as to the best rolling walker you can get for an obese person. In a hurry? Click here to jump right to my recommended extra wide bariatric rollators and see which is my favorite. Obviously, if you’re overweight, you’ll want a rollator that’ll be able to hold you up. This means you’ll want the rollator to have a very sturdy build. Look for aluminum or stainless steel body, which are materials known for durability and performance. Also look for 4 wheels. This will add stability to the model, and give you equal support on both sides. Some rollators only come with 3 wheels, which can be useful for some people, but not bariatric patients, generally. You’ll want to be comfortable when you need a break from walking. This means the seated part of your rollator should have a decent amount of cushioning to keep you comfortable when you need to rest. Ideally, the backrest portion of the rollator, if it comes with one, should also have some cushioning for added support and comfort. This is an important consideration because this measurement determines how well you will fit into the seat. Ideally, your hip width should be less than this measurement for the best fit possible. It is a given that heavier seniors will need a wider rollator. However, this wider size also makes the whole rollator wider. You need to check the width of your doorways in your home and make sure the rollator is narrower than your smallest doorway. Usually, the bathroom door is the smallest in most homes. Putting all, or most, of your weight on your hands and wrists while using a walker as a bariatric patient can put a huge strain on these parts of the body. If these handlebars aren’t padded, this can make that experience so much worse and much more painful. Make sure there is some kind of padding on the handles of your rollator, both for comfort and safety to give you a secure grip on the rollator itself. These handles should also be adjustable to make sure the rollator fits you properly. The handles on many rollator models slide up and down to fit the height of the user. When a rollator is set at the proper height, the handles should be at the same height as the wrists when they are held to the side of the body with a small bend in the elbow. This heavy-duty rollator checks off all of the boxes. It has a 500lb capacity but only weighs about 25 pounds total. It’s very wide, at 29”, making sure to accommodate the shape and size of any overweight person using it. It also has large 8” wheels for added stability, and the body is made out of a very durable steel frame, which is a very important feature. In terms of the seating features, both the seated area and the back support are padded with extra cushioning for comfort. It also has awesome height adjustable handles for taller people who need the handles to be higher for their comfort and optimal mobility needs, and a built-in easily accessible safety brake system. 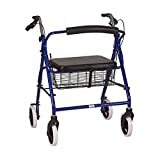 Best of all, this walker easily folds up flat for storage purposes. This is a great rollator as well, with a softly padded oversized seat and removable backrest for added comfort and a 500lb capacity. It’s also built out of durable, sturdy aluminum material. The handles are adjustable in terms of height, and there’s a built-in brake system in this one as well. What makes it really unique is its indoor/outdoor capabilities. The wheels are optimized for either condition, giving you a smooth ride no matter where you are. It also has a little travel pouch for your belongings, which is a unique, handy feature. The only drawback to this walker/wheelchair combination is that it’s much more narrow than the first pick, with the seat only measuring 18” wide. While it has a large weight capacity, it may be difficult for a bariatric patient to fit in this pick. This rollator is probably the most versatile, with both a removable seat and backrest. Both are cushioned, so when you need that extra support and rest, you can have it. But if you just want a sturdy walker and nothing else, they simply come right off. This rollator also features easy to use hand brakes for easy operation and peace of mind, along with that great built-in storage container underneath the seat for your belongings. I really like that it has all the features a bariatric patient needs but is also the narrowest rollator I have reviewed. This rolling walker is great because it’s incredibly lightweight, lighter than any of our other picks, but still has a 375lb capacity. It also has super large wheels compared to other picks, which give you added stability and control. It folds up for storage incredibly easily, and the flip-up seat is versatile and cushioned for comfort. The backrest could be more comfortable, as it’s really just a padded bar, but at least it provides some sort of support. Underneath the seat is that nifty storage container that’s also removable, so this is a really great, lightweight pick, although it has a smaller capacity than others. Getting around has never been easier with this high quality, next generation rolling walker. Finally, this pick may the best combination of all the features you need in a rollator as a bariatric patient. It has large wheels, a 400lb capacity, but it’s lightweight at about 20 pounds. It has a cushioned backpad and padded seat that’s about 18” wide, with a velcro pocket underneath to hold your things and easily seal them away for safety. It also has a wider distance between the handles for people who need that extra room. 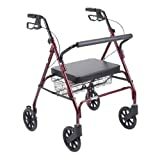 Medline is known for quality rollators and wheelchairs, so this is a great option. Relator, X-Wide, Heavy Duty, 400 Lb. Ultimately, it’s up to you to decide which bariatric rollator is best for you, but my personal favorite is the Invacare heavy duty rollator because it has a wide seat and high weight capacity but it is also the most narrow so it will fit through more doorways. My second favorite is the Medline 400 lb model . It is the lightest of the bunch but has a wide seating area and lots of adjustments. 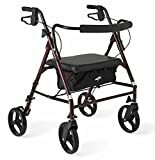 For seniors who weigh less than 300 lbs, check out this buying guide for standard rollator walkers. 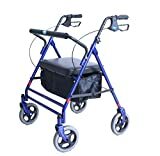 Do you have any tips or suggestions about the best walker/wheelchair combination for bariatric patients? Comment below with your input!